I have just completed reworking the Filipino Rayadillo Norfolk Pattern Tunic page on the Los Rayadillos website. Lots of new photos of two original tunics and some new information. Your opinions, comments and additional information are eagerly sought. Click the link below to visit the page. Love your website! Cant stop looking through it. Thanks for sharing these artifacts. You are really helping us preserve our history. I have a question for you about the info you have on that particular page. One popular theory gives credit for the design to the famous Filipino artist Juan Luna. He was living in Europe at the time and could have been influenced by English fashion. He was the brother of General Antonio Luna who is said to have commissioned him for the task. Is there any hard evidence of Juan Luna designing these uniforms?...Im sure there would be sketches. From my understanding, both Juan and Antonio were on the side of Rizal, which also means they were against the Revolution of 1896. Antonio Luna did not participate in any part of the Revolution. Since these uniforms first appeared during that time, I don't see why Juan Luna would design uniforms intended for an Army when his ideals were against such a thing during that specific time. Also another thing to note, supposedly Antonio received his military training after the Revolution. He joined the forces when Aguinaldo returned to the Philippines from HK in 1898, a couple years after these uniforms. I dont know...maybe someone here can shed some light on this issue and pull something out of a hat. Maybe Juan Luna made improvements to the design after his brother joined the forces. I am a huge avid fan of Juan Lunas art, I would like him to get credit...but I just don't see Juan Luna getting sole credit for designing all these uniforms and symbols. Ayon po kay Hen. Jose Alejandrino (Kaibigan at Staff officer ni Hen. Antonio Luna)sa kanyang aklat na "The Price of Freedom" sinasabing bago umalis si Juan Luna bilang Delegates ng Rebolutionary Junta sa HongKong ay inatasan siya ng kanyang kapatid na si Antonio na gumawa ng isang desenyo ng uniforme para sa Filipino Army. Ang layunin ng pagkakalikha ng bagong uniporme para sa 1898 Army ayon kay Hen. Alejandrino ay upang maiwasan ang clan loyalties at para magkaroon ng sense of unity sa hanay ng kasundaluhang Filipino. Nagsimula po ito noong ma-institutionalize(Ginawang Standing Army o Modern Army)ni Hen. Antonio Luna ang kasundaluhang Filipino noong 1898.
desenyo po ang pagkakaiba, salubong na bulsa sa dibdib ang desenyo ni Juan Luna. Habang ang suot naman ng mga kastila ay may patayong bulsa sa dibdib naman. Di malinaw kung hango nga talaga sa English Norfolk Tunic ito, basta ang alam ko lang Desenyo ito at gawa ng isang Filipino. Thanks for visiting the website. I'm very glad you like it. I hope to add more revolutionary artifacts soon. I have a fairly large collection of captured insignia that was brought back by Major Harry Bandholtz of the US Army and Philippines Constabulary. 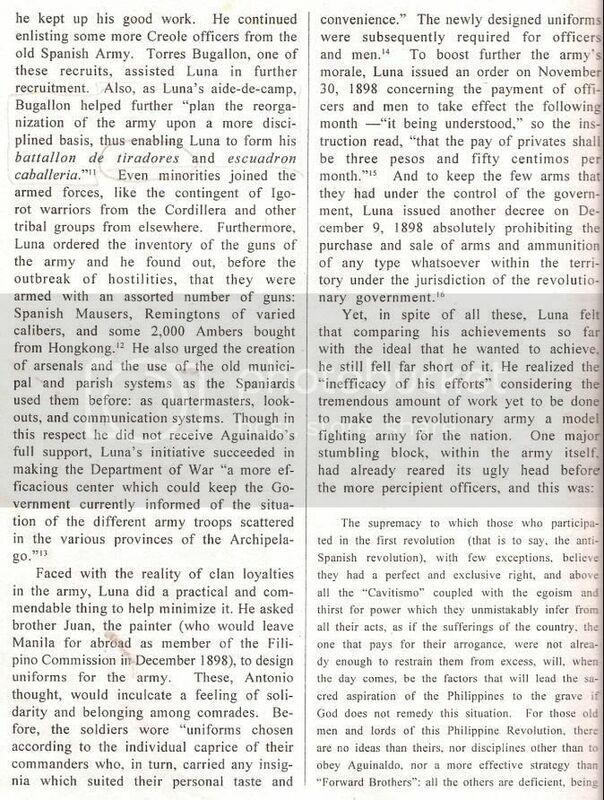 As for documentation on the role that Juan Luna played in the design of the uniform, all I have reference to in print is from the book "The Rise and Fall of Antonio Luna". Page 106 has the line "He asked brother Juan, the painter, to design uniforms for the army." Like everyone else, I would love to see more evidence, especially design drawings. Mr. Hosalla, could you share your thoughts on the matter in English? My Philippine language skills are non-existent, sorry. You know what you call a person that speaks only one language: an American! Keep up the good work and let's share what we find out. Sorry took awhile to get back with you...been busy all weekend. What Mr. Hosalla has written is a good lead for you and of high importance. From the gist of his post, according to Gen Jose Alejandrino(friend and staff officer to Gen Antonio Luna), in his book "The Price of Freedom", when Juan Luna became a delegate of Revolutionary Junta of Hong Kong(~1898), his brother Antonio asked him to design a uniform for the Filipino Army. Going by Gen Alejandrino view, the aim of the new uniform for the 1898 Army was intended to avoid clan loyalties, to have a sense of unity, and maintain a decree(law or standard) with the Filipino army. The uniforms in 1896 and 1897 revolution are not designed by Juan Luna, the Generals designed and made their own style(no uniformity). Gen. Antonio Luna wanted a institutionalized standard of dress for the Standing Army or Modern Army, and was ruled(put in to law) in 1898. Close up photo of Luna and his uniform. do you know where i can buy this rayadillo fabric? If you're in Manila/Makati, contact members from the BNKasaysayan Yahoo group. They should be able to help you out. 1) So it seems there was this correspondence between General Luna and his brother who was a renowned painter of his time, describing "a uniform" for officers. I have yet to know what is the full text of this correspondence, if it in fact still exists. Did it mention uniforms for enlistedmen?, for minute details on service branches, or for a rank system of insignias? 2) Juan Luna was a master painter and illustrator. Surely to further impress his and his brother's ideas on Aguinaldo's high command, he would have made exquisite paintings, drawings and other illustrations of these proposed uniforms. What?...were these pictures destroyed, lost, or locked up in some private collectors vault? 3) "Blue pants"?, O.K., but "black stripes"?.....If we look General Luna's photo, he himself must have ignored his own uniform regulations. The stripes on his pants are light colored. Also note, Luna even goes so far as to be one of the few high ranking officers in the Philippine Army who didn't wear shoulder boards. His maverick reputation extended even to his uniform. He pinned his insignias directly unto the cloth shoulder straps of his jacket. Antonio Luna doesn't even carry a saber or dagger in any of his military photographs, which is rather strange since he had the reputation of being the most renowned swordsman above all the other officers in the army. Hi, sorry to bring a month old topic up again. Since Juan Luna was commissioned by his brother Antonio to make the designs, is it safe to say that the revolutionary army back in the Battle of Manila '98 wore different uniforms as previously stated? I suggest that you read the book of Gen. Jose Alejandrino(The Price Of Freedom)G. Vivencio Jose "The rise and fall of Gen. Antonio Luna" and visit the sight of Mr. Bill Combs(Agmonho.com)for further information about the Juan Luna Designed Philippine Army Patriotic Rayadillo Uniform. Heres the bottom half of the pic showing Lunas pants. Im curious to know if Juan Luna also had sketches or blueprints of these uniforms. Being Juan Luna was his brother, I am guessing Juan designed Antonios uniform personally and made it to his taste...but then that would be going against what both men had in mind, a uniform standard that would be across the military. Antonios is definitely different then all the other officers and generals. What you mention about him not carrying a saber or dagger is interesting also. I know both the Luna brothers opened up a fencing school in Manila. Antonio does not carry a pistol either. Makes me wonder what was his thinking behind this. and visit the sight of Mr. Bill Combs(Agmonho.com)for further information about the Juan Luna Designed Philippine Army Patriotic Rayadillo Uniform. Just a little correction so the person doesn't get lost: Bill Combs' site is www.agmohio.com; and yup it's a great resource for Rayadillo research as well as early US, Imperial German, WW1, and WW2 militaria. I stand corrected and its OK! What battle of Manila you are referring? was it the Mock Battle of Manila of 1898? (Spanish-American War) or the battle of Manila that happens on Feb. 4, 1899 during the Fil-Am war? ----No regulation on uniforms, all uniforms are made according to the caprice of their Generals. ----The 1898 Army is a standing army(Modern Army)it is guided with regulations in all aspect including uniforms. Posting this info for Macky. I am referring to this document. Oh, thanks a bunch Macky, VeeVee. Actually I also send this article to Mr. Bill Combs last March 2008 to at least shed light on his Question about the origin of the Philippine Rayadillo uniform. This is with regards to your article in your site(Rayadillo Norfolk Tunic Uniform: Filipino or Spanish? )I would like to contribute something. In his book "The Price of Freedom" Gen. Jose Alejandrino mentioned that Gen. Antonio Luna ask his brother Juan(The famous Painter in Europe)to design a uniform for the Philippine Army. Gen. Alejandrino is a staff officer and a close Friend of Gen. Antonio Luna. Gen. Antonio Luna is the Asst. Secretary of War in the Short-lived Emilio Aguinaldo's Government. I will send you the Photocopy of the reference not later this week. I am trying to find out what the name of the hat that was worn that the scouts could pray without taking the hat off. I see pictures everywhere (it sorta reminds me of the pope hat) but not one ever gives the name. Help. The ones worn by muslim scouts? It's called a "tubao".